Now that Christmas is a coming (and the goose is getting fat), I've been in the shopping mood--it's terrible, I tell ya. I've been on the lookout for cute things to buy for my family, add to my own wishlist, and this year, shop for my Secret Santa recipient for this Christmas exchange. Is it too early to start shopping for Christmas? Maybe. But who said being early is a bad thing? 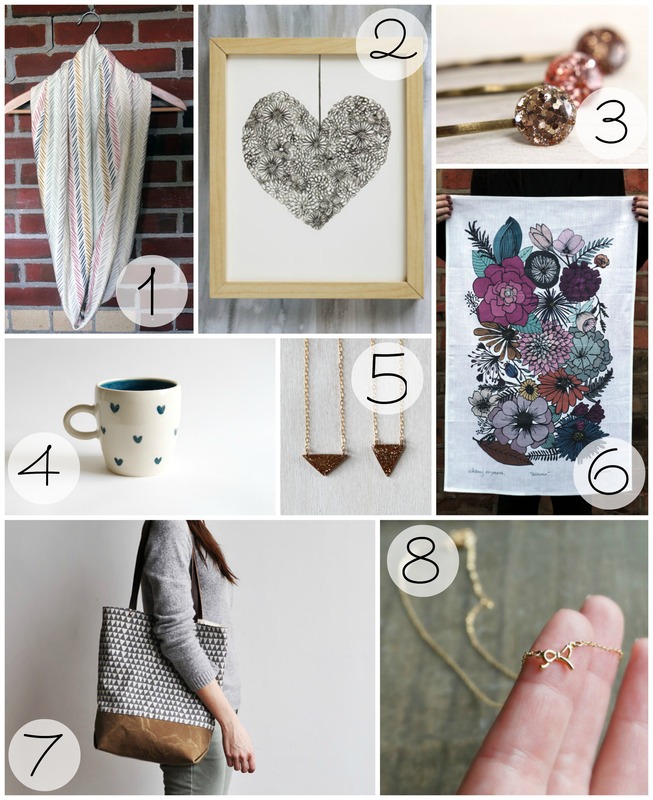 Linking up with the lovely Amy and her Etsy Favorites link-up! Same! I love shopping and wrapping gifts for my family. No matter what I get them, I get little butterflies in my stomach as they're opening them. I love the element of surprise (even if they were the ones who picked out the present!). uh #1 & #7 LOOOOVVEEEEEE oh my gosh seriously I want them all. & its never too early to start shopping for Christmas (I just hate when stores are open on thanksgiving + have Christmas stuff out before Halloween even happens that's just too much - rant over). great etsy finds! + yay for linking up!! Uh, same here. :) I so love that scarf (just found it this past weekend, I think!) and that bag--along with the Rouge & Whimsy bag--has been on my wishlist for awhile now! Glad you agree with me on Christmas shopping! I have a few presents that I've gotten and am saving since summertime, haha. So it's definitely never too early to shop. But I do agree with you on the stores. It's craaazy how they go all out on the holidays before the preceding one has even taken place. It's crazy, I tell ya. And I love those triangle pendants and the tote, too! I've really fallen in love with triangles and neutrals as of late. It's not even funny. ooh!! love all of these, but if i had to pick two: that heart mug and the super cute bag!! nice picks, lady! Loving all these things!! I can't wait for that gift exchange! I love most of these but I think my favourite is the scarf it's absolutely gorgeous. I am going to etsy for my work secret santa present. I love Christmas, and gift giving, and decorating. I'm trying SO HARD to hold off until Thanksgiving. It's tradition in our family to put a tree up the day after Thanksgiving, but now that I'm seeing everyone's decorations on Facebook, I'm getting so ANTSY!!! BUT ANYWAY, loving the dish towel the best of your picks. So pretty! And that sounds good to me, girl! I'm definitely not a seamstress or anything and always love the idea of DIY gifting so that list sounds good to me! Isn't that floral dish towel gorgeous? I love that floral print and I thought of you when I first saw it because I know that you've also mentioned your love for florals! Haha, I love that we're all in the same boat with this. Whenever I even browse Etsy I immediately wish I hadn't clicked over because I always find something else I wish I had. Oh, materialism. :) But at least with Etsy, it's all about supporting small businesses, right? too many cute things in one place!! my goodness.. I wouldn't be mad about receiving any one of those sweet things on your wishlist..
(especially that tote) <3 great taste, lady!